Paint the walls. White is trending. A 200-400 square foot room can cost $400-$1,000 for a pro, but the cost of a can of paint ranges from $25.00-$40.00, with brushes and rollers available under $20.00. You can DIY. Rehab the cabinets. It can cost more than $1,000.00 to paint cabinets, so scrub with oil soap and wax, and tighten hinges. Paint is great if you can, but refreshed goes a long way. New drawer/cabinet hardware is in the $5.00 range per handle or pull. A new faucet will only cost you $50.00-$100.00. New lighting fixtures should deliver warm, inviting light, but can be simple and under $200.00. A coat of epoxy on the counters, done by a handyman, is about $400.00, and they will look a lot better. If you can install granite, that’s about $1,000.00 and popular with buyers. A little staging is a big plus. $10.00 glass jars holding colorful fruit and cookies, or other similar touches, add a warm atmosphere real estate agents recommend. Freshly painted walls, in a warm neutral color, help any room. You can DIY the entire project for around $100.00 (a few cans of paint, some painters tape, and paint rollers are all you need). For outside the home, $150.00 will get you an electric power washer to clean walls and driveway. You need fresh walls to present a clean home to potential buyers. There’s a lot You Can Do Outside, Too! Good-looking, updated landscape will not only get you a fabulous ROI, but it is also the first thing potential buyers see in person. Work that first impression! Ignore these problems at your peril: they are red flags that suggest a neglected home. The average cost is $650.00 and up, but these are essential projects that, if not completed, could cause a buyer to walk away from your home. An unkempt porch is another red flag for the buyers. Repairs range from $200.00 to $1,000.00. A repaired porch won’t leave buyers wondering if your home has hidden issues. Repair, don’t replace. Repairing a section of the roof will cost about $4.50 to $15.00 per square foot. If your roof is currently leaking or if the portion of the roof has been damaged, then this is a fix you’ll need to make to ensure you pass the home inspection. Check out Roof Cost Estimator’s tool for an estimate. There are many inexpensive projects that add to that first impression and could get you a 100% return on investment, plus 10%. Paint your front door for $100.00-$300.00. A bright color is welcoming. Repair an old garage door for around $200.00. Fix/update outdoor lighting for $150.00-$200.00 per installation. Buyers value the safety and the aesthetics of this one. Add decorative plants. Plant a garden or border with natives, which will cost you $10.00-$15.00 for several flowers. Group $10.00 pots on stairs or patios. Potted “statement” plants flanking the front door cost in the $45.00-$120.00 range. All these low-cost steps bring you the most bang for your buck for under $1,000.00 and make your house stand out in the market. 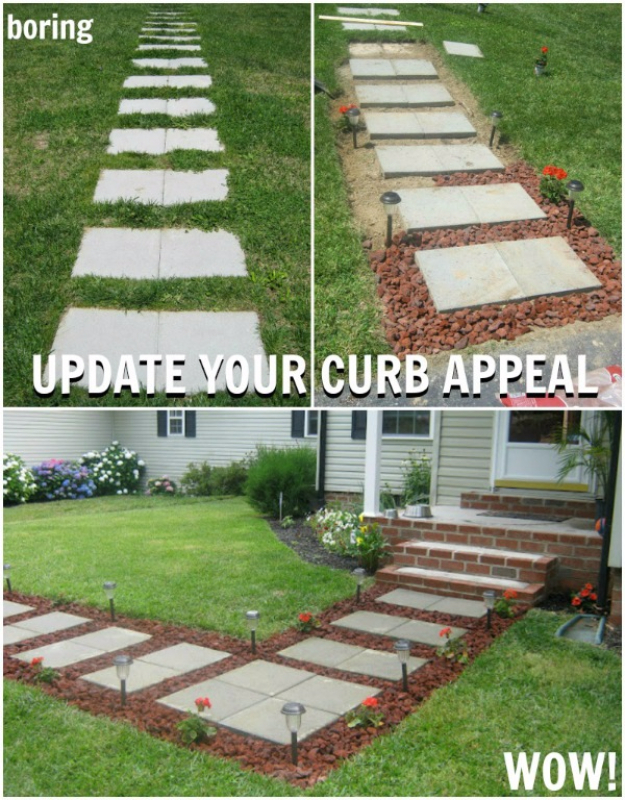 Every step toward a more appealing property is a step closer to a great offer.